Note: Due to changes required in UVLayout to fully support Maya's groups, the new plugin is now only available bundled in with the UVLayout v2.08 or later installers. The new plugin will not work with earlier versions of UVLayout. Here's info on the latest version of the interface plugin for Maya, with coding by myself and Wolfsong; it allows you to run UVLayout from within Maya, and selected objects can be sent back and forth with the click of one button or hotkey. 1) The Maya plugin files are now included with all current UVLayout installers (v2.08 and up) and an "Install Maya Plugin" button has been added to the UVLayout GUI for easy setup. You dont need to edit the MEL file anymore to configure the plugin. 2) Multiple objects can now be transferred between Maya and UVLayout, and it doesn't matter how they are grouped. 3) Object group and shading groups names can now be used within UVLayout to select polys for other operations. First, check that Maya's OBJ export plugin is loaded; you can do this via the "Plugin Manager" (check your Maya documentation for details). Next, run UVLayout and click on the "About UVLayout" button at the top of the GUI. If a Maya installation was found on your system, an "Install Maya Plugin" button will be there. If the button is missing, read this post. So click the Install button and a file selection window will appear, where you need to select which version of Maya you want the plugin files installed into. Next, click the "Install Here" button and the plugin files are copied into their appropriate folders. You can then exit from UVLayout, start Maya, and you should see the UVLayout shelf. You may also want to define a hotkey within Maya that calls the uvlayout_send function; I use Ctrl-U. This saves you from having to click on the Send button or icon. In fact you can kill the interface window, once everything is going, if you define a hotkey to send objects to UVLayout. 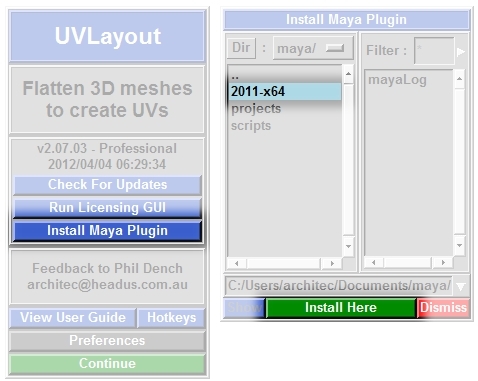 Run Maya, open up the UVLayout shelf, then click on the "Info" icon to open up the plugin interface window. Next, click on the Run button or icon to run UVLayout itself. Finally, check the Load Options, specifically if you're wanting to edit existing UVs, or start fresh (see image below). Click the "Turn On Debugging" option and additional information about the communications between Maya and UVLayout are written to a couple of log files. These can be useful to us if you have problems with the plugin that need debugging. Use the usual Maya actions to select one or more poly or subdiv objects, then click on the "Send" button or icon. The selected objects should then load up in UVLayout after a second or two. By default, the plugin will detect the type of object selected in Maya (i.e. poly or subdiv) and will tell UVLayout to load the mesh accordingly. If you tick the "Forced Subdiv Mesh" option, that will tell UVLayout to load any poly meshes as SUBD surfaces. 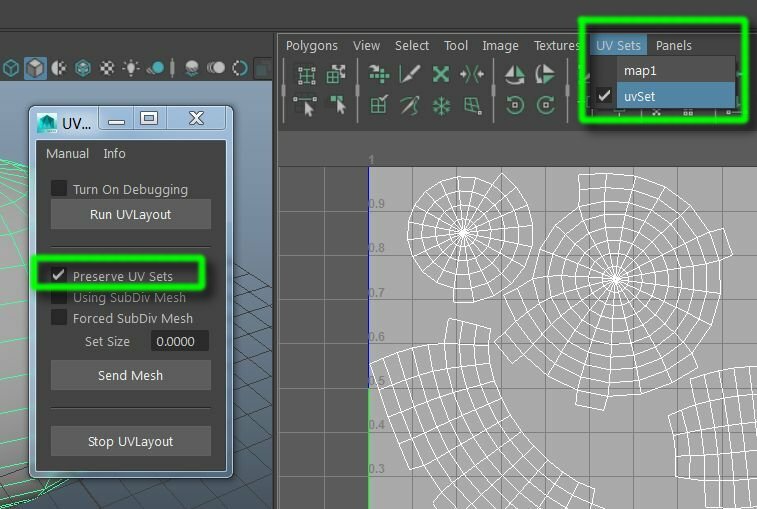 You can also force UVLayout to load meshes with a fixed UV scale by setting the "Set Size" value. If you have "Set Size" preference in UVLayout set, this will over-ride that value. When you've finished flattening those objects in UVLayout, click on UVLayout's "Send" button. Then back in Maya just tap the 'x' hotkey; Maya should then load the flattened objects, replacing the ones you originally sent to UVLayout. When you're done flattening objects, click on the "Stop" button or icon. This will not only kill UVLayout, but it also stops the background script jobs. UVLayout v2.09 or later installers provide partial support for Maya LT users. When the "Run UVLayout" button is clicked, a pop-up dialog appears; cut'n'paste the command into a Windows Command Prompt window to start UVLayout. A bit ugly, but once that's done, the plugin seems to work fine. - UVLayout doesn't quit automatically when you use the Stop shelf icon in Maya. - The plugin normally auto-detects whether the mesh being sent is a Poly or SUBD surfaces and tells UVLayout to load it accordingly, but you'll have to manually set the Import options in UVLayout before you send the mesh over. UVLayout shelf or icons missing? If you run the script commands directly from the maya command window, does anything happen? If those work as commands, then you can make your own shelf icons to run them. Here's some experimental support for UV sets in the Maya plugin. You can still only edit one set at a time in UVLayout, but the new plugin script allows you to select which UV set gets sent to UVLayout, and then the new UVs are loaded back into that UV set. Previous versions of the script were replacing all existing UV sets with just a single UV set when UVs were sent back to Maya. NOTE: This updated script was included in UVLayout v2.09.04, so if you have that version or later, you don't need to download this update; you'll already have it. First enable in Info window, then select which UV set you want to edit with UVLayout. UVLayout MEL script supporting UV Sets. UVLayout looks for one of the following folders in your home folder, and if they're not there, it hides the install button. It'll also check for the MAYA_APP_DIR environment variable, which can be defined to point to an alternate maya folder. And finally, you can override all of the above with the HEADUS_MAYA_LOCATION env variable (i.e. set it to the path of your "maya" folder if its not in your home folder).